The Employer’s Confederation of the Philippines in partnership with the Philippine Chamber of Commerce and Industry-Western Visayas and the Metro Bacolod Chamber of Commerce and Industry, Inc., spearheaded a two-day training workshop on the Promotion of Responsible Supply Chain in Asia, held on 14-15 March 2019 at L’Fisher Hotel, Bacolod, Negros Occidental. The training workshop was attended by a total of forty-eight (48) officers, employees, and proprietors of various establishments in Bacolod City, as well as nearby provinces such as Aklan and Iloilo. Most of the companies represented came from agriculture and food industries. Also in attendance were representatives from the International Labour Organization (ILO) Fredy Guayacan, Programme Manager, Responsible Supply Chain in Asia (RSCA) ILO Regional Office, Bangkok; Stephan Ulrich, Programme Manager, ILO Sustaining Competitive and Responsible Enterprises (SCORE) Team and the ILO Manila team headed by its Enterprise Development Specialist, Hideki Kagohashi. Highlights of Day 1 included the official welcoming of guests and participants by the PCCI-Western Visayas Governor Donna Rose Ratilla and ECOP Director General Jose Roland Moya. It was followed by engaging discussions on corporate social responsibility, occupational safety and health, wages, hours of work and child labor while day 2 of the workshop discussed relevant topics on forced labor, grievance, freedom of association, harassment and equal employment opportunity. 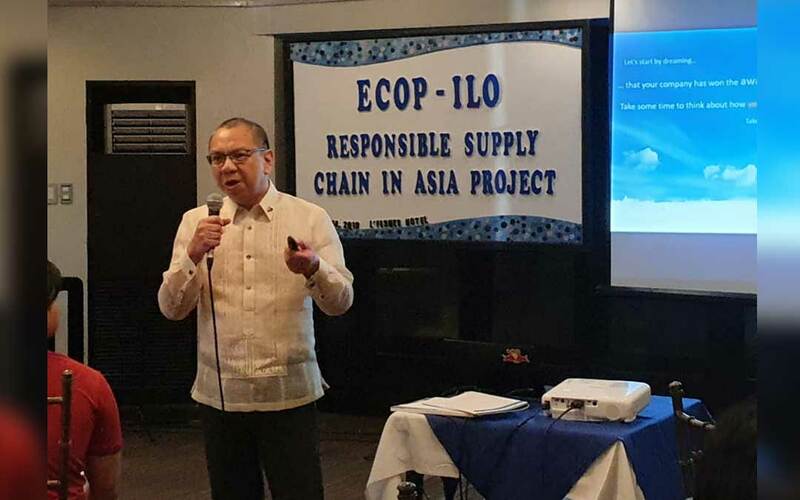 The ECOP training team is composed of its Director General Jose Roland Moya, Rhodora Snyder, ECOP’s CSR Manager and a focal person on Occupational Safety and Health, Ray Tadeo, Manager of Training and Development, and Robert Maronilla, Manager of Legal Department. The resource speakers and the facilitators also imparted their knowledge on why and how business owners should strive to gain a better understanding and practical “know how” of being responsible employers by embracing CSR as a strategic tool to sustain and expand their business operations and not merely as a compliance issue.